Southwest Greens of Phoenix, Arizona, just completed these two beautiful synthetic turf putting greens with nice slopes and undulations, both built around trees in middle. 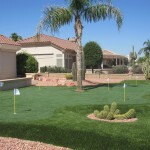 At Southwest Greens of the Valley you can work with their team to build the green that meets your exact needs and specifications from slope to distance and more. The constant improvements in technology and installation techniques, sets Southwest Greens of the Valley apart from every other company. 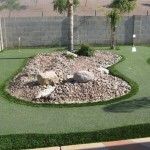 We are proud of our reputation as the leader in the industry for the design and installation of synthetic turf amenities and will continue to strive for excellence with each project we construct.For more information visit www.swgarizona.com or call 480-664-9417. Take you putting to new heights! From the pool to the course!